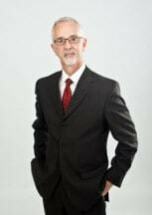 J. Anthony "Tony" Goebel has been an attorney for over 30 years. Except for a federal clerkship upon his graduation from Indiana University School of Law-Indianapolis in 1984, he has practiced law in Southern Indiana and Louisville, Kentucky his entire career. During most of those years Tony was with Wyatt, Tarrant & Combs, LLP which is one of the largest, most respected and most prestigious firms in the Mid-West, before opening the Goebel Law Office in February 2007. As a trial lawyer, Tony worked on many high profile cases. His practice has included personal injury, wrongful death, environmental and business litigation. Tony has lived in the Georgetown area for over 25 years and has seen the community grow and prosper. Seeing the need for quality legal services close to home. Tony became the first attorney to open a law office in the Georgetown area. His practice is now concentrated in the areas of Personal and Accidental Injury, Wrongful Death, Social Security Disability and Commercial and Business Litigation. In April 2007, Tony opened a law office in his hometown of Madison, Indiana. Although he had not lived in Madison for some time, Tony never lost connection with the community, where his roots date back six generations. It has been a lifelong dream to return to Historic Madison. Tony believes in giving back to the community in which he lives and over the years he has used his legal talents by serving on the Boards of several non-profit organizations and volunteering as an attorney for The American Center for Law and Justice and The Rutherford Institute. He is a charter member of the Georgetown Lions Club and has served as the club's Vice-President and President. Don't wait another day for the help you need. Goebel Law Office has locations in Georgetown and Madison and serves clients across Southern Indiana and the bordering Kentucky counties.